Just how does an annotator get those colored arrows and squares onto the board? There’s really nothing to it once you know the trick (and, really, it’s not even a trick – it’s covered in the Help file under “Graphic commentary”). It’s simply a matter of holding down a key or key combination and either clicking on a square (to get a colored square) or dragging the mouse (to get a colored arrow). If you need to remove a green colored arrow or square, just repeat the process and the green square or arrow will be removed. Now that we know how to draw colored arrows and squares on the chessboard, the next step is to figure out what each of these graphic annotation forms signifies. Certainly there’s noting stopping you from using any color to signify whatever you wish, but that would be like using other chess annotation forms and symbols in a non-recognized manner. You wouldn’t be caught dead using a question mark to denote a good move, would you? 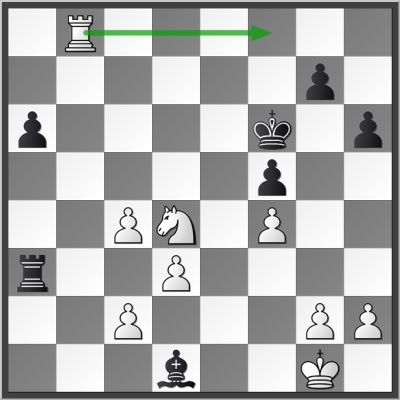 …we see that the Black Bishop attacks the c2-pawn, which is adequately defended by the White Knight. Meanwhile the White Rook on b8 can move to f8 and check the Black King. And, once you know what the colors signify, this information has been conveyed without using a single word of text — just some colored arrows and squares. If you use these suggestions when annotating games using these graphical forms, you’ll be using them the same way that the ChessBase annotators do, and thus you’ll avoid the confusion that’s caused by not following a standardized annotation form. I was searching for the markers software and I found you illustration very useful. I have chessbase software and I was totally unaware of this utility. Thanks for such valuable article.